Love is best expressed by sending this gift of Hypnotic the Best of All Breakfast Gift Basket to your near and dear ones. 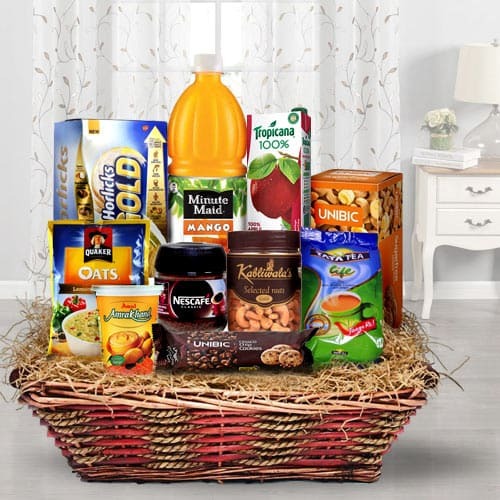 This outstanding collection of treat consists of One Bottle Nescafe Classic - 50 gm., One Pouch Tata Tea Life Tulsi, Brahmi, Cardamom and Ginger - 100 gm., One Cup Amul Amrakhand with Real Mango - 200 gm., One Pouch Quaker Oats Lemony Veggie Mix with Real Capsicum - 40 gm., One Carton Unibic Cashew Butter Cookies Sugar Free - 75 gm., One Carton Unibic Chocolate Chip Cookies - 150 gm., One Carton Horlicks Gold Health Drink Malt - 400 gm., Salted Cashew - 250 gm., One Bottle Minute Maid Mango Juice - 1 ltr. and One Carton Tropicana 100% Apple Juice - 200 ml.